Every day, new and dynamic trends emerge within the hospitality and event industry. The likes of venue managers, operators and owners are expected to keep up & be flexible within their space. Here at IHS Global Alliance, our designers are continuously innovating product solutions to take your experience to the next level. So we interviewed Melbourne Convention and Exhibition Centre's (MCEC) set-ups manager, Jag Bal to find out more about his experience with our innovative solutions and how this has assisted the venue in keeping up with its dynamic space. 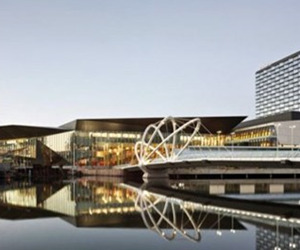 Recognised as Australasia's Leading Meetings and Conference Centre, MCEC connects customers with multi-purpose spaces, leading technology, award-winning food and unrivalled expertise to create memorable event experiences every day. A guiding principle of MCEC is a commitment to innovation through embracing new ideas and developing creative solutions. To create a positive customer impact through integrating set-up solutions that are aligned with industry trends, have a modern and practical design, are environmentally-friendly and allow for the best utilisation of available event space. IHS Global Alliance worked with MCEC's Set-ups Manager, Jag Bal to create a custom Cross Cube product range. IHS: As new and dynamic trends emerge within the hospitality and venue space, what do you feel is an important consideration in staying agile when it comes to utilizing your space? MCEC: To always push boundaries and do something different from what others currently offer in this space. Experimenting with new ideas and designs that are practical and provide a high-quality user experience. IHS: What was the challenge you and your team were facing before you found your solution with IHS? MCEC: We had tables that were bulky and heavy. These took up a lot of space and were not practical for the team to assemble, set-up and store. IHS: Why did you consider IHS as a solution to your business needs? MCEC: An opportunity arose to design something unique to MCEC. The Cross Cube solution presented well and came in as many sizes and heights as our needs required. We could custom build a solution, which was a very important factor in our purchasing decision as other suppliers could not provide a product with this specific capability. IHS: These industry trends discussed earlier, extend beyond the configuration of the venue set-up, and are also focusing on environmentally-friendly products. How important is purchasing a product that has also considered the environment for your business? MCEC: At MCEC we strive to be a leader in developing environmentally-friendly and sustainable products. Our Convention Centre has been certified as a 6-Star Green Star venue and we look for a similar commitment to sustainability when considering our suppliers and their products.